Totally renovated 3 bedroom house with bay views. Watch Sea World fireworks on selected holidays from large front deck. Chef's kitchen with granite counter tops and stainless appliances. Bathrooms are completely new. French doors off the kitchen lead to the landscaped back yard. Minutes from Mission Bay and Sea World. 6 miles to downtown or airport. Minutes off the 5 freeway. Off street parking. Natural cooling breeze from the ocean and Mission Bay and fans are available for hotter times. A/C is not provided and normally is not needed. My wife completely renovated this property and we are in our 7th year offering our vacation home to families from all over the US and several international locations. 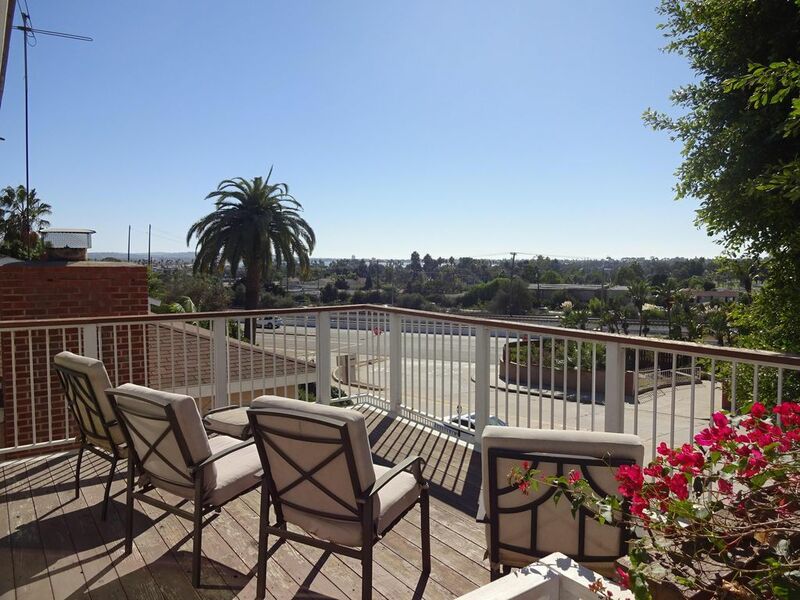 It has a great location central in San Diego and close to most of the local attractions. We live less than one mile from our vacation home. Private house with private back yard and BBQ makes this a great place for families to relax after sightseeing and vacation activities. The kitchen and open living/dining areas are a great relaxing area to congregate. 3 spaces in driveway and free street parking too. WiFi included at no charge with log in and password given at check in. WiFi is limited to 5 devices at a time under our Basic Cable Agreement. Both inside Towels and Beach Towels are provided. up to 5 devices allowed on our TV/Internet/WiFi provider. Spacious Living Room area including two sofas two easy chairs dining table and access to open kitchen. Standard drip coffee maker, coffee, and condiments included. Flat Screen TV in Living Room area. Basic Cable TV with approximately 200+ channels. No Premium or Movie Channels except for Basic Cable TV. Spectrum Cable/Internet/wifi included no additional charge. Some DVDs are available under the flat screen TV provided in the Living Room. DVD Player also provided. See the Sea World Fireworks from the front deck when available (subject to Sea World Schedule). Several courses including the legendary Torrey Pines within 10 miles of our house. I am an avid golfer and can help you arrange tee times! There are 18 stairs to get to the front door from the front house driveway. There are 10 stairs to the house back door in the back yard off the alley behind the house. All good kitchen appliances. Queen master Bedroom sleeps 2. Queen second bedroom sleeps 2. 3rd Bedroom with 2 twins sleeps 2. Sleeper Sofa in Living Room sleeps 2. Master bath with large shower. 2nd bathroom has double sinks and shower/tub. Everything you need for cooking. Books & games for kids and adults. Full Sized Separate Laundry room. Cable TV including Free WiFi. Large Patio area in back with Gas Barbecue. Large driveway in front and plenty of street parking. We loved our stay! The house manages to be both spacious and cozy; the backyard is beautiful; and there's easy access to a ton of San Diego attractions and landmarks (the property owners are also fantastic--thanks again Larry!). We'd highly recommend staying here! Many thanks to a great family visiting us. We especially like it when 3 generations spend the Holidays at our vacation home! Booked at the last minute for Thanksgiving weekend. Larry was a gracious host. The house was in a good location close to the freeway. Minutes from Mission Bay Park and the beaches. Loved the views from the deck. The backyard was quaint. We had a little trouble with the internet on Thanksgiving day and Larry responded immediately. We would rent again in a heartbeat. Thanks for taking good care of our vacation home. We are always glad to hear that our guests are happy with our place. This is our second stay at this property. It has a wonderful outdoor area for a barbecue. This property is perfect for a family of 5 or 6. Great location to get around San Diego and Coronado. Great kitchen for preparing meals. Would benefit from some updated furniture (couches), kitchen supplies and tv channels. Glad we got to see the World Series games! The house was beautiful, accommodating & well stocked. The owner, Larry was amazing I every way! We could not have been more pleased!! We will definitely stay here again anytime we are in San Diego. The house was amazing & we found new friends in the owners, the Fuller’s. This is a great place for family vacations. We had 8 people and fit just fine. It was clean and had everything we needed. Larry was helpful and accommodating. Thanks we are happy to provide a nice home for families to stay! Minutes from Mission Bay with water skiing, jet skis, playgrounds, exercise courses, sailing etc. Pacific Beach is just 2 miles away. Beach is 3 miles away. Sea World fireworks can be seen on holidays from living room and front deck- just 2 miles away. San Diego Zoo less than 10 minutes. San Diego County Fair/Del mar Race Track 20 minutes north. Downtown night clubs less than 10 minutes. Trolley station 2 miles away. Lots of golf courses nearby. Torrey Pines GC only 6 miles away. Riverwalk 3 miles.